When I arrived at 3:15 pm, Mom was sitting in her recliner in her room watching television. She was upset. "Anne, this is a terrible show about dinosaurs that swallow people. Turn it off!" I checked the television; it was the National Geographic channel with a show about crocodiles. I turned it off. "It's just a show about crocodiles, Mom." "You came late. I've been sitting here too long watching this television. When I'm here alone, things get scary." She was absolutely accurate about those statements. She had been alone since 2 pm, apparently not sleeping, and her mind takes her to strange places when she is alone. I helped her walk with her walker to the toilet, but for some reason she could barely do it today. After walking one hundred feet to the dining room yesterday for breakfast, and one hundred feet back, today she could not place her right foot firmly on the ground. Instead she put only her toes down, walking well with her left foot but taking only small steps with her right foot and never letting her heel touch the ground. Next we worked on sending valentines to all her children and grandchildren, and her sister-in-law as well. She did fine at signing her name as coached. When we got to her grandson in the Naval Academy, I told her to write, "I'm proud of you. I was in the Navy too." She wrote, "I'm proud of you! I was a Navy Nurse!" "Buy yourself something pretty and useless. I'm so proud what you are doing at Crested Butte. I'm just now learning to walk again with help from your Aunt Anne! Love, Grandma Gussie." A moment of clarity! She knew where Jennifer lives and that she's working in adaptive sports there. And she proudly added her news about walking. Because she apparently wanted to give Jennifer some money, I slipped a $20 bill inside the card before sealing it. After doing the Valentines, when I tried to get her to walk to dinner, she could barely do fifty feet. She was limping along not putting her right foot down completely--but did not complain of any pain in her feet or legs. A caregiver brought us the wheelchair. Julie A., meanwhile, was pushing her walker to dinner behind us and yelling "I wish I were dead! I wish I were dead!" At dinner Mom sat down next to Howard and Jeannie, the new sweethearts on the floor. Jeannie has a sharp tongue but for some reason was adopted by Howard, who only arrived a month or two ago, as his surrogate spouse. Howard is a gentle ex-businessman who walks around trying to making phone calls and keep appointments. He seems very happy with his arm around Jeannie. "Okay, Mom, enjoy your dinner. I'm leaving now." "You're not going, are you? Don't leave me alone! They never take me back to my room after dinner." "Now, Mom, Connie will be here any minute. She'll take you back to your room. I have to leave." "I don't like the way you speak to your child!" interrupted Jeannie, glaring at me. "You shouldn't talk to her that way. She'll never grow up." "I'm sorry, Jeannie," I said. "Goodbye, Mom." I went back to her room to get the pants we bought yesterday, which I will take to a tailor to be shortened. When I passed the dining room on my way out, I heard Mom loudly singing, "Jesus loves me, this I know, for the Bible tells me so. Little ones to him belong; they are weak, but he is strong. Yes, Jesus loves me! Yes, Jesus loves me...."
Mom was never particularly religious during the first sixty years of her life, though she did get to church once a month or so, and more often after she retired. Punching in the code to open the door to leave, I sighed with relief. Note: The mystery of why she was singing was partly answered four days later when I took her to dinner. Another private caregiver then said to her, "Sing, Evelyn. Are you going to sing for me? And Mom started singing "Jesus loves me." At least there's a reason why she suddenly was singing... She had done it on some occasion before, so now someone prompts her to do it. CDs are always played during dinner, everything from Diana Ross to church music. 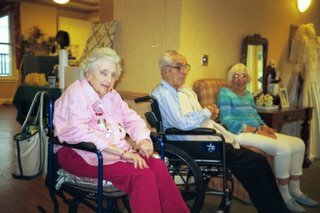 Sometimes various caregivers or residents sing along. I feel better knowing that Mom's singing on this occasion was not completely out of the blue.